Our furry friends are part of our family, and we want them to come with us everywhere but never has this need been more important than with an emotional support animals. If you suffer from one of a wide range of mental health conditions, an emotional support animal is not just your friend. And considering just how stressful airport travel and flying can be to anyone, it makes sense that you would want to fly with your animal. Flying with your emotional support animal has significantly evolved in recent years, but it can still be a complicated process. 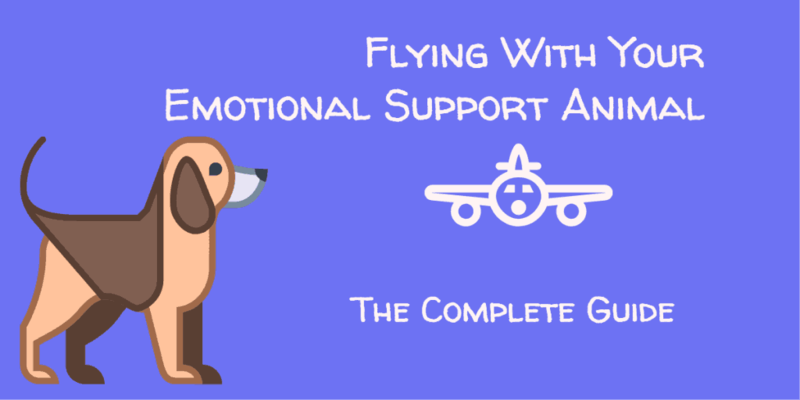 For this reason, we have created this ‘Ultimate Guide To Flying With Your Emotional Support Animal. How your animal can fly with you. 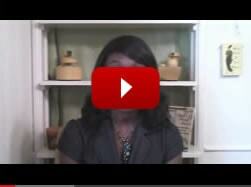 What the airline policies are for flying with your animal and much more. 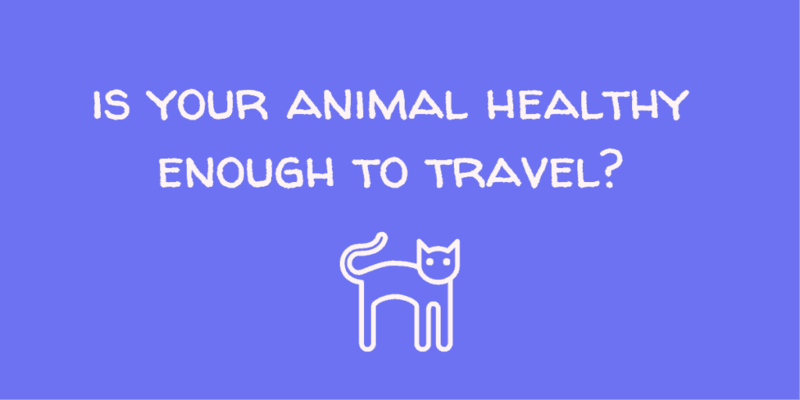 Is Your Animal Healthy Enough To Travel? The first part of travelling with your ESA is to decide if they are ‘fit to fly’. This is a decision that as the owner, you must take into consideration. Studies conducted into airline travel with dogs discovered a wide range of effects. One such study took 24 beagles, 13 males and 11 females and monitored them physically and also via video to see how air travel affected them. They were all given an industry approved sedative, and blood samples were taken throughout the trip and various stages. The study concluded that air travel is stressful for the animals and in particular the loading and unloading of the animals. However, there were times during travel that the dogs normalised and appeared in their normal states of stress. But is it safer to fly your animal in the cabin? Cabin travel is by far the preferred route of air travel for any animal and as you have an emotional support animal it is highly likely that your animal will be allowed to travel with you in the cabin (we will talk about airline policies later). The ability to be with and see their owners will help to reduce stress for both the owner and the animal. However, recently a dog was discovered dead having been placed in the overhead locker. The story went viral when a United Airlines flight attendant asked the passenger to place her dog in the overhead locker. When they landed the dog had died, and United Airlines have since apologised and taken responsibility. Fortunately, situations like these are rare, and life dictates that we must travel, so if you decide flying with your emotional support animal is the right thing for you, we will be giving you the ‘lowdown’ on everything you need to know and do. Some airlines will require that you submit veterinary records 48 hours before the flight, so our first tip is once you decide to fly, take your dog to your vets to have them checked out. Your vet is the best placed to give you the professional opinion about the animals eligibility to fly based on both past and present medical conditions. For example, if your animal is prone to anxiety, they are unlikely to suggest flying or other issues such as heart irregularities. So treat your wagging wonder to a visit to the vets, they might not thank you for it then, but it is essential before you travel. 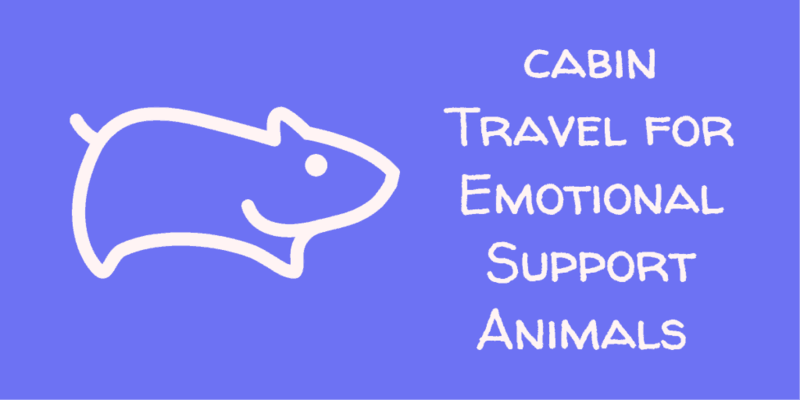 Will Your Emotional Support Animal Travel In A Cabin or Cargo? One of the more pressing question that ESA owners have is whether their best friend will travel in the cargo section of the plane or the cabin. 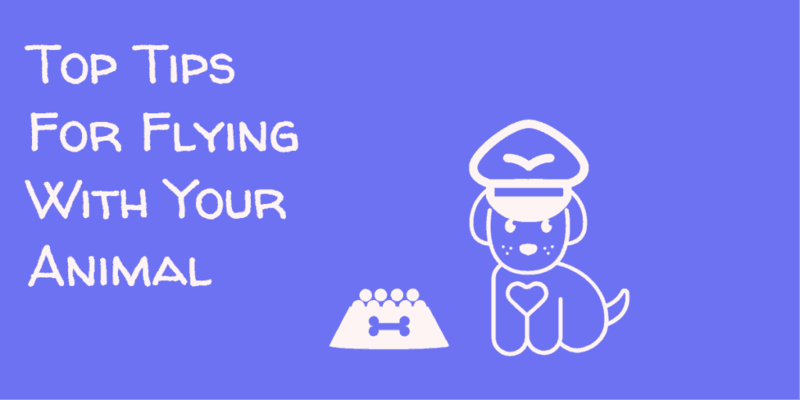 Generally speaking the Airline will allow you to travel with your emotional support animal, however there are a few conditions that most airlines require to be met. What Weight Must An Animal Be To Travel In The Airline Cabin? Most airlines state that the animal must be under 20 pounds in weight for it to be able to travel in the cabin. What Length Must An Animal Be To Travel In The Airline Cabin? Generally, an animal can travel in the aeroplane cabin of it is less than 18″ from nose to tail. What Size Crate Must My Animal Have To Be Able To Travel In The Airplane Cabin? Emotional support animals are allowed to sit on the lap of their owners during travel as long as they do not interfere with other guests, eat off the tray tables and are no larger than the size of a 2 year old child. That being said, keeping your animal on your lap during travel could get difficult and it makes sense to have a carrier for your pet that you can use to place them in. 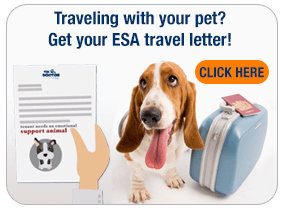 This is especially important during travel as if your animal starts to misbehave some airlines will then treat the animal as a pet and revert back to their airline policies which mean you will have to place your pet into a carrier. So it is worth knowing the requirements. There are 4 main requirements for the carrier that your animal might be contained in during the flights. 1. It must have a waterproof bottom. 3. It must be secured with a locking mechanism. 4. It must enclose your pet: IE. The head must not stick out. Your pet carriage needs to be able to go under the seat in front of you, so in essence must be around hand luggage size. Sadly as we will learn later not all emotional support animals are welcome in the cabin. So, if your animal cannot come on board the plane is it really that bad? In most airlines that accept pets as cargo, the cargo hold is climate controlled, pressurised and quite comfortable for both humans and animals alike. Therefore if your animal is not an emotional support animal species that they allow in the cabin or if their behaviour is not good enough to fly, you might have to consider placing them in the cargo hold or face being away from them when you arrive at your destination. 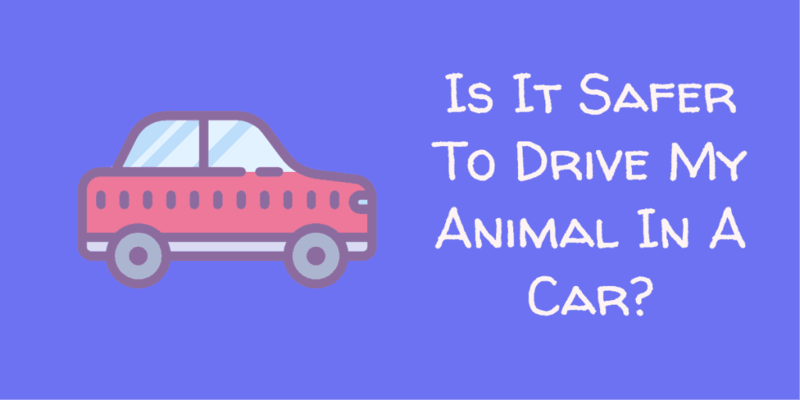 Is It Safer To Drive My Animal In A Car? Flying is not for everyone but as Superman would say it is statistically still the safest form of travel. In the USA in 2017, there were a staggering 40,000 automotive fatalities. And an estimated 20 million injuries as a result of cars. So the odds of sending your ‘up’ on the road or in the sky are heavily staggered towards air travel. That being said I think we can all safely say that air travel is a smooth experience once you get up to cruising altitude. In contrast, roads can be full of potholes, turns and bumps making it a generally unpleasant experience for human and animal alike. So despite the obvious pitfalls, air travel makes sense for our emotional support pals. 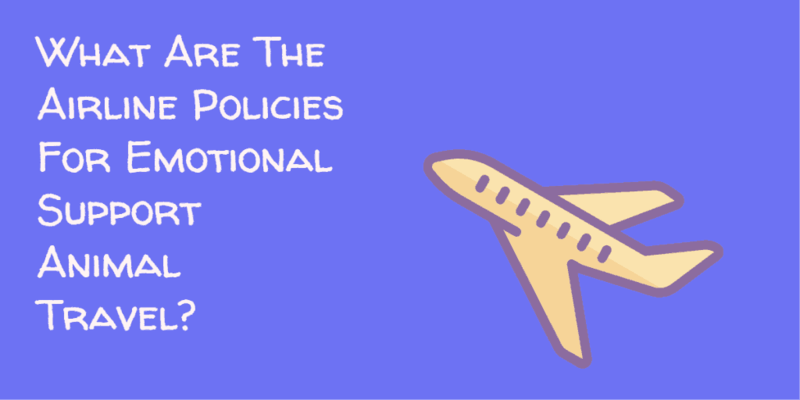 What Are The Airline Policies Travel With An Emotional Support Animal? If you are thinking of booking a flight we thought it would be super useful for you to be able to check out the travel policies for the most popular airlines. We have placed both a summary in the text and also a link to the full policy to make life easier. Most airlines have variations of their policies depending on where you are going to travel however there are some general rules. While we know that there is a wide range of emotional support animals out there that do a fantastic job, airlines do not see it that way. Generally you will be fine with a cat and a dog but outside this the airlines have differing views. One thing that most airlines insist on is good behavior. Excessive barking, growling, jumping on other passengers is a strict ‘no no’. If this happens the cabin crew can instruct you to place your dog either in the carriage container you brought with you or possibly in the cargo hold if they can access it. The airlines will usually allow your animal to sit on your lap as long as they are no larger than a 2 year old child. Every airline will insist that you have the correct paperwork for flying with your emotional support animal and this generally means a letter or documentation form a certified medical practitioner that states you have a recognised mental health condition. This is something we can help with if you need it but without it you will not be able to fly with your animal. Is There A Different Policy For Travelling With An Animal Than An Emotional Support Animal? Most airlines have 3 separate policies, the first us their regular policy for flying with an animal and the other is their policy for flying with an emotional support animal or and another policy for flying with a service animal. 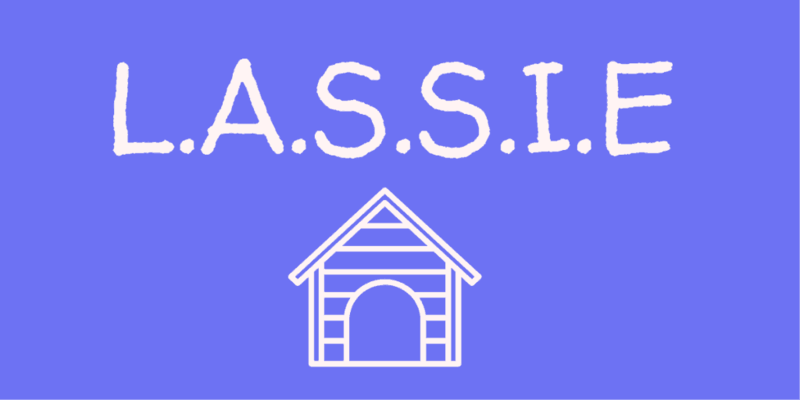 The policies for the service animal and emotional support animal tend to be similar. Delta Airlines will allow Emotional Support Animals to travel in the cabin with their owners as long as they either sit under the chair in front or on your lap. They are not allowed to eat off the tray tables and must be well behaved at all times. To fly you must have submitted your paperwork to them at least 48 hours prior to flight, have a certificate of training and a documentation from a mental health professional that states you need the emotional support animal. To learn more below and download the forms click below. Hawaiian Airlines have a detailed policy for travelling with an emotional support animal. Like Delta they have strict rules about behaviour and if the animal is caught lunging at other passengers or causing a disturbance they will treat the animal as a pet and revert back to their policies for carriage of the animal. 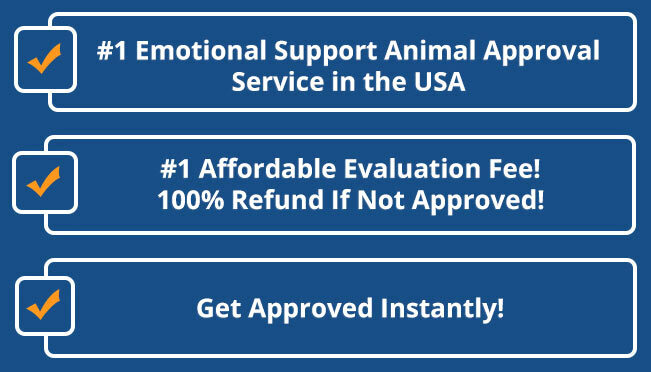 In their policy it states that to fly with an emotional support animal the customer must have a diagnosed and recognized mental health condition that features in the Diagnostic and Statistical Manual of Mental Disorders-Fourth Edition. The animal can spit on your lap during flight (including take off and landing). Jetblue have made a lost of the types of emotional support animals that you cannot take on a flight with you. They will however accept dogs, cats and even miniature horses. As with the other airlines you need to have a letter supporting your condition from a certified mental health practitioner and give 48 hours notice. In addition they will not allow ‘exotic animals’ onto the flight, these include rodents, ferrets, insects, spiders, reptiles, hedgehogs, rabbits, or sugar gliders. Alaska Airlines have recently made changes to their policy for flying with an emotional support animal. They strongly recommend guests should have a certified copy of the animal’s health certificate from their veterinarian for their entire journey. 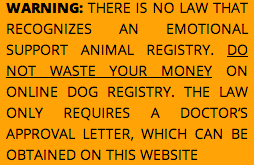 Refer to Alaska’s pet policy for requirements for a health certificate. United Airlines have a detailed policy for travelling with an emotional support animal however they have recently made changes. A letter from a medical practitioner. And also documentation that shows the vaccination record and also shows that the animal has been properly trained to behave in a public setting. Spirit have also decided to refuse a few animals to travel as Emotional support animals these are snakes, reptiles, ferrets, rodents, sugar gliders, and spiders. Aside form that you are good to go as long as you give the standard 48 hours notice and you have the usual required forms including health records of the animal. You can place your animal onto your lap during travel as well. Ok, so those are the policies, you have decided on your airline of choice, and you are all set, now it is time to fly, and our next section is full of the best tips and industry advice for flying with your dog. 1. Choose A Pet Carrier That They Will Love. Regardless of if you call it a pet carrier or a kennel, it is the space that your pet will travel may travel in for parts of the flight. Remember this is their ‘house’ for the next few hours and as such needs to give them enough room to move. Leak-proof: you need the container to be leak-proof because there are no gardens for the dog to do their ‘business in’ at 30,000 feet. Air: Ensure at least 2 sides are made from mesh to give excellent ventilation. Secure: The carrier should be escape proof so make sure the fasteners work. Shell: If you can get a crush proof dog carrier this is best, it will give an added layer of security for the animal in case anything falls out of the overhead lockers or the carrier moves around in turbulence. Is Cabin Sized: It must be the required size and fit under the seat in front. Extras: Our final part is the least important but a handy addition. If your carrier has some extra compartments for you to place dog leads, treats and water this will make your life easy. As human travellers, we know the feeling of getting onto the plane and finding yourself sat behind a screaming baby that never shuts up. Sure, they might look cute, but it can be a 4-hour nightmare flight for anyone. Now think about your animal. Their ears can hear significantly higher frequencies than humans which = more sensitive. There is no doubt that air travel will stress your animal so why make it worse? Ask at the check-in desk if any babies are sitting near to you and ask to be moved if you can. Remember that if your animal behaves badly the cabin crew could ask you place them into your carrier. This is another carrier based tip. If you want to make sure that your animal has the least stressful journey, then try and get it used to the carrier early. Take it out in the carrier in the car, place it in the carrier at home. Take it shopping in the carrier. It won’t take long for them to feel comfortable with the carrier and that will help on the flight. Several airlines will only allow a small number of animals onboard during one flight (and no, we don’t understand why either, perhaps they are worried about a canine con air situation). So once you have decided to fly, make sure you book your animal onto the flight as early as possible. If you can’t do this make sure you arrive at the airport as early as possible as they operate a first come, first served basis. Airports now have what they call ‘pet relief’ stations. Find out if your airport does in advance by either using the web or ringing them on the phone. Federal regulations state that if the airport serves over 10,000 people a year, then they must have a pet relief area. And if you are not sure what one is, they are basically a toilet area inside the airport but for pets. Did you enjoy our guide to air travel with a an emotional support animal? 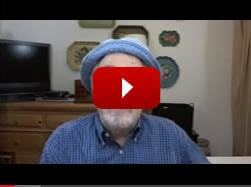 Did it answer your questions or are you planning to travel soon? Perhaps you have already travelled on a flight with your animal and have even more useful tips. Whichever it is, please comment below and let us know your thoughts or tips.